An International RSM auditing organization awarded Vexve with a diploma in succeeding in European Business Awards competition in November 2014. RSM Auditsum awarded altogether 12 Finnish companies. RSM Auditsum arranged an award ceremony on 5th November in Helsinki. 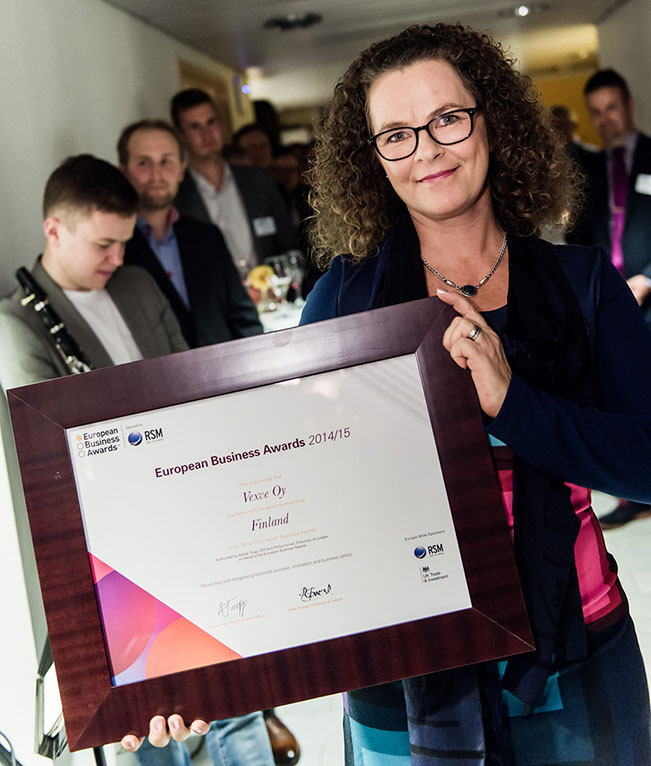 RSM International CEO Jean Stephens congratulated Vexve for succeeding in European Business Awards competition. Ms. Katri Savijärvi, Marketing and Communication Manager represented Vexve at the ceremony. Vexve is the globally leading provider of valve solutions for the heating and cooling needs of cities and industry. Developed for demanding applications, Vexve valve and control products and hydraulic control solutions are used in district energy networks, power plants, and internal heating and cooling systems of buildings. We receive invoices primarily as e-invoices. Visit VexveCloud for logos and other marketing material.